Unified Government Commission – Welcome to Wyandotte Daily! The Unified Government Commission will be looking at refinancing the Legends theater bonds on Thursday, July 10. The $6.9 million refinance was discussed at a UG Economic Development and Finance Committee Standing Committee meeting Monday night. Lew Levin, UG chief financial officer, said a payment of $6.8 million is due on Aug. 1, and the refinancing would allow the UG to extend the financing for four years. The proposed terms with Security Bank are 2.75 percent, $100,000 annually, he said. There is another balloon payment in four years of $6.6 million. “It allows the government to look for opportunities to move forward with the sale of the theater while at the same time continuing to pay off the debt on the theater,” he said. Doug Bach, UG administrator, said since the Legends theater was designed and built, the UG has never put any general funds into it, but all of the costs have been covered by theater operations. But the top priority is to keep a good-quality theater in Wyandotte County that will have long-lasting sustainability, he said. As long as costs are covered, the UG does not feel it needs to hurry to find a buyer. If a quality buyer is found that would maintain the theater over a long period, the staff would come back to the commission and recommend the sale, he said. The J.E. Dunn construction firm plans an expansion into Wyandotte County. 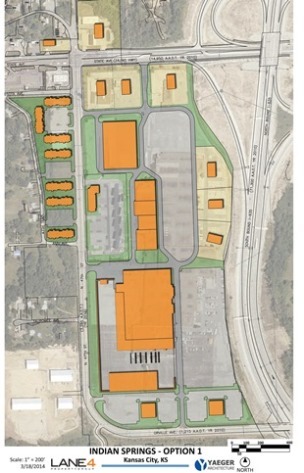 A company official presented a plan for a 22-acre site with a $9 million investment for an equipment rental facility at 240 S. 65th. The project was discussed at the Monday night Unified Government Economic Development and Finance Committee meeting. Kurt Peterson, an attorney with the Polsinelli law firm representing Dunn, said it was a significant expansion from Dunn’s Missouri operations into Kansas. The site would eventually employ 65 persons, he said. According to UG information, an 80,000-square-foot facility is planned, and it will consolidate three Dunn logistic divisions on the site. The rental facility would lease equipment to Dunn’s affiliates and to third parties, Peterson said. Besides the $9 million investment, there also would be about $45 million invested in equipment, he said. George Brajkovic, UG director of economic development, said the 22-acre site is currently vacant. The property currently pays the local government about $1,600 in taxes. He said the first year of revenues to the UG if the development goes in could be about $90,000 to $100,000. It will be a payment in lieu of taxes. He said the project is applying for industrial revenue bonds, not backed by the UG, and it will qualify for a 65 percent abatement. The site is very challenging, a long narrow piece of property with drainage issues, according to Peterson. The development is expected to be considered by the UG Commission on May 15, and a public hearing will be held, Brajkovic said.